Each Valentine’s Day, I love to bake up a fun treat for my family. We never go out for a date on Valentine’s Day, preferring to go out on a less-crowded night, so I try to make a special meal and dessert at home. I vary it each year, but these little “Love Cakes” have been a part of our Valentine’s Day several times! The cakes have the best texture on the day after baking, so I recommend making them the day before you plan to share them – which is handy if you are a nighttime baker like I am! You can bake them, let them cool, store overnight and frost the next day. 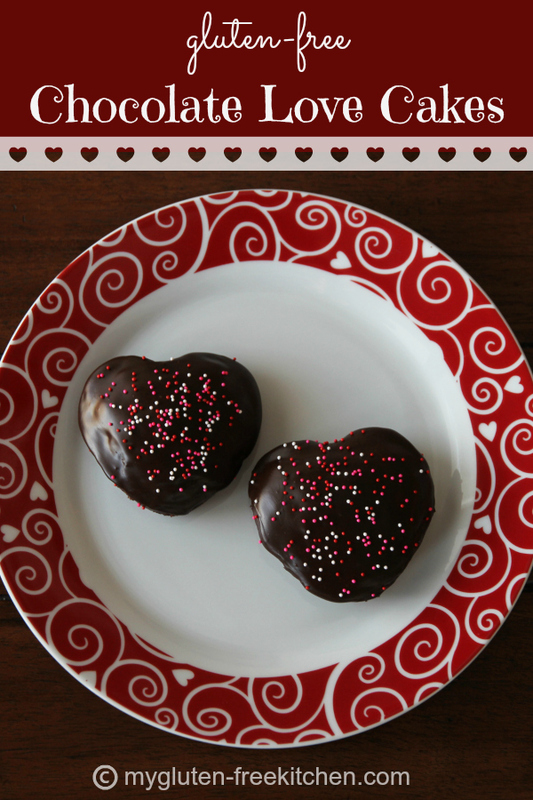 I use one of my favorite gluten-free chocolate cake recipes to make these little heart-shaped cakes. They couldn’t be easier to make either, using this Wilton heart pan that bakes 6 heart shaped cakes at a time. This is definitely a treat that your kids can help make and decorate too! You are probably thinking right now that you don’t need another pan, but I can attest that I’ve gotten a lot of use out of this pan over the years! Every year for Valentine’s Day, I also use this heart pan to bake my boys’ favorite gluten-free peanut butter banana chocolate chip muffins in! They enjoy coming down for breakfast. I like those little things like that to make the holidays special. I like to use part Hershey’s Special Dark Cocoa and part regular cocoa in both the cake and the fudge frosting. It adds that deep dark color to them both. In the recipe below I note that, but you are welcome to just use all regular baking cocoa instead of any dark. Without further ado, here’s the recipe for these delicious cakes! These have the best texture the day after baking them. On baking day, they have a more spongy texture, by day 2 they have the perfect moist crumb! Spray cooking oil in the bottoms and sides of your heart shaped pans or muffin pan and set aside. In your mixing bowl, combine flour, xanthan gum, sugar, baking soda, and salt and set aside. Add buttermilk, eggs, and vanilla and beat for one minute on low-medium speed. 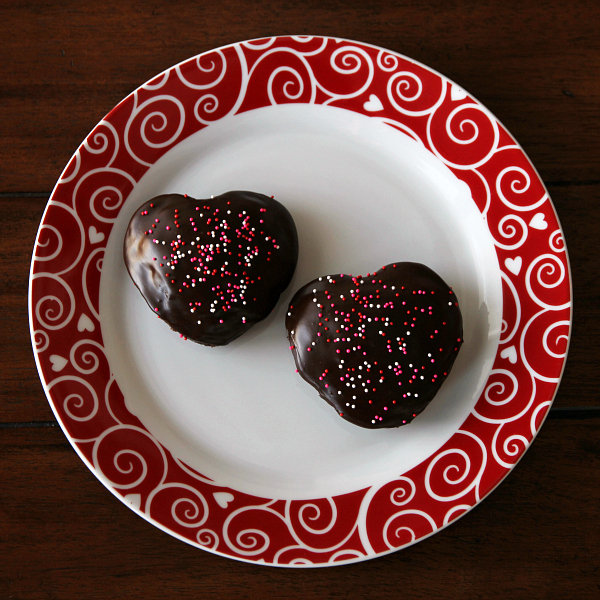 If using the mini heart shaped pan or cupcake pan, pour ¼ cup of batter into each opening. Bake at 350° for 17 minutes or until a toothpick comes out clean or with a few crumbs (no wet batter). Let cool in pan for 4 minutes, then turn over pan and the little cakes should just fall out. Wait to frost until completely cool. Using a medium glass bowl, melt the stick of butter in microwave. Whisk in cocoa powder, then return to microwave for 1 minute. Add powdered sugar and milk alternately, beating with a hand mixer until creamy. Add vanilla last, beating in until mixed well. If you use this frosting while still warm, it is easily spreadable and has the glossy finish when dried like you see in the photo but can slide off of whatever you are frosting. If you let it cool completely, then it firms up and can be placed into a pastry bag for piping for decorating cakes or cupcakes. The icing can be refrigerated to use later; just microwave 10 seconds at a time, and stir, until you get to the right consistency for piping or spreading. As always, be sure to double-check your ingredients for gluten. Feel free to try this with your preferred gluten-free flour blend, but I only guarantee a delicious, non-gritty result if you use one of the flours I recommend - gfJules or Gluten Free Mama. For the cocoa powder, I like to use about 1/2 of dutch-processed or Saco blend cocoa and 1/2 Hershey's special dark cocoa. That is how I achieve a nice dark brown to my cupcakes and icing. These would be great for bringing to the classroom. 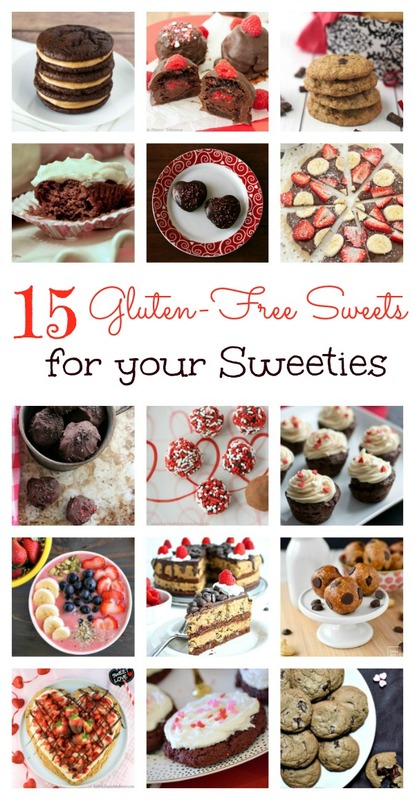 I know everyone (gluten free or not) would enjoy these! These look really good! Also thanks for the nice giveaway. Looks so yummy and pretty! Would love to win the mixer too! Love how these turned out, Michelle! They are so cute. My girls would flip if I made these for them on Valentine’s Day! The Candy Apple Red mixer is gorgeous! Currently my kiddos have been loving a recipe I found in a vegan/GF cookbook called “Death by Chocolate Muffins” I was going to spruce them up for love day, but might just have to give these a try instead. These are sooo cute! And sooo chocolately! I want to bite into them right through my screen! That looks delicious! Such a sweet V-Day treat. Thanks for the giveaway. I can’t wait to try theses. I really hope my son likes them. ummm wowowow! these look incredible! These look delicious! The mixer would be awesome to win! so excited to check out all these awesome gluten free blogs! These little cakes look delicious! My daughter and I are going to make these. They look absolutely delicious. The brownie bombs look delicious! Great blog with wonderful recipes! These look incredible! Great for your sweetie for sure! I love the copper/gold one???? Can’t wait to try this recipe! I love the new mixer colors and glass bowl! These are mouthwatering!! Definitely would pick the red mixer. These little cakes are so adorable Michelle! Sharing! Just beginning our gluten free journey, excited to give this a try! Does this recipe work if you live in 5280ft altitude (Denver)? Are there adjustments you have to make?